Romance! Dinosaurs! Giant Robots! The charming Lincolnshire town of Stamford, in Lincolnshire! That's no moon, it's a … Dinosaur Planet! 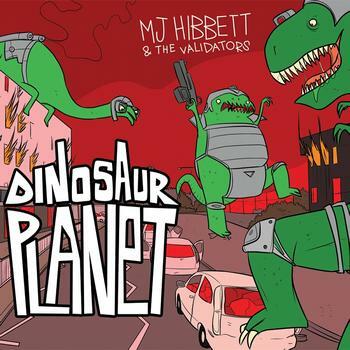 The best indiepop concept album about dinosaurs from space that you will ever hear. As a long-time fan of both MJ Hibbett and dinosaurs I've been waiting to hear this album for a fair while. Yet for some reason when it first arrived I was slightly nervous about listening to it. What if it didn't live up to my expectations? What if there wasn't any tunes, and instead it was all story? Well, I'd need not have worried. The tale starts, as you might not expect, in Norwich. And, locations aside, follows brilliantly the beats of all great alien invasion stories. Done with heart and direct reference to its influences Dinosaur Planet never slips unknowingly into cliché. It revels in it's theme.. Wonderfully it at the same time creates it's own cannon, taking ideas and running with them throughout the entire story. For example we're told that 'Dinosaurs Talk Like Pirates' and presented with evidence to prove such. Rather than being a one line gag about their agape expressions this is becomes part of the Dinosaur Planet mythology as well as ensuring the different species sound different on tracks performed entirely by the voice cast. In terms of songs too, there's plenty of highlights. 'Theme From Dinosaur Planet' is the obvious one, sounding excellent as a stand-alone single with a massive chorus and instant, novel memorability. On a personal note however, it is 'The Battle Of Peterborough' that begs for particular mention. With the full Validators ensemble (plus added bugle) and Hibbett's narration the city is expertly trashed. Not only by remarks about the wider country not caring (or even knowing about it's existence) but by an army of dinosaurs that flatten it. Well, flatten it more. Peterborough is already pretty flat. Perhaps having lived in Peterborough is an advantage here (that could possibly be the only time that this sent ace has ever been written) but when is said about Queensgate shopping centre post-missile “It was nothing but a crater / A million pounds of improvements had been made” it's hard not to have a massive grin on yr face. (Strangely during the Battle it seems that the dinosaurs passage from March to Peterborough completely bypasses Whittlesey, which leads me to assume that the small market town that I come from completely escaped devastation). As he does brilliantly, Hibbett also finds time for a little bit of wider social commentary. On 'Wither The War Room?' our General asks about the location of the large map of the country with all of the flashing lights. Her aide responds by informing her that it had been decided that this particular need of the military's could have been provided best by the private sector. “We've got an AA road atlas now”. There's not an awful lot more that I can say regarding the plot of Dinosaur Planet without giving it away. The fact is I've probably already given you too many of the punchlines. But suffice to say that as well as dinosaurs there's giant robots (also from space) and much death and destruction. With the completely contrasting themes that each of the dinosaurs and robots get (a nautical jig for the former, electro-tinged punk for the latter) you may guess there'll be conflict between Earth's two visitors and from 'Strangely Attractive' that there's some bizarre goings on. But that's as far as I need to go for now. What is worth a mention briefly however is how the voice cast of Dinosaur Planet are simply excellent and that the production is top-notch. With the title track being aired at MJ Hibbett's acoustic sets as far back as 2007-ish this album has been a long time in gestation. But it's worth the wait and so much more. It's rare that you can hear an album as an artistic vision fully realised, but this is what Dinosaur Planet is. I love the uniqueness of this album. Indiepop concept album are my obsessions and this is one of my favorites. 'Theme From Dinosaur Planet' is definitely the standout track. I love it. Wish you could find the best ringtone for your mobile phone and share this ringtone for everyone. Thank you for your attention.